With its picture in a picture design, “The Jay” is based on an inlaid panel of a cabinet that resides in Buckingham Palace. The panel itself once belonged to the extensive art collection of King George IV, who had the work commissioned in the 18th century during his reign. The resulting tapestry features an artfully represented Jay stealing fruit from the arrangement in a flower vase. The flora bursts from the bowl, loaded with berries. Butterflies are depicted in the upper left and lower right. The fruit design carries into the outer border, which uses fleur-de-lis inspired designs to complete the ornate look. 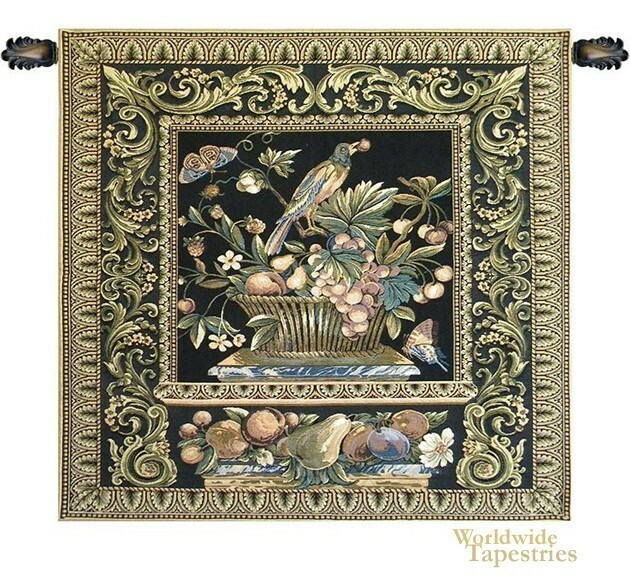 This tapestry is lined and comes with a tunnel for easy hanging. Note: Tapestry rod and tassels (where pictured) are purchased separately. Dimensions: W 38" x H 27"
Dimensions: W 52" x H 46"